I always enjoy Saturday’s Northern Alliance Radio Network broadcasts on AM 1280 The Patriot. This past Saturday’s edition of “The First Team” (John, Brian and Chad) was especially entertaining since they were reviewing the 2007 winners of their “Loon of the Week” award. The recipient of said award on the second Saturday in January had to be my favorite. Rep. David Wu (D-OR) is currently in his fifth term in the US House. When you’re one of 435 members of a legislative body you typically aren’t that well known outside your own state. 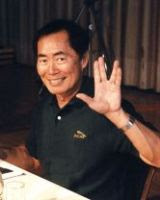 But in January of 2007, Wu became somewhat famous for his “Klingons in the White House” speech. Since hearing that bizarre speech, I have to admit I was a little impressed at what appeared to be Wu’s intimate knowledge of the Star Trek phenomenon. And then it occurred to me. Could Wu possibly be the long lost illegitimate son of actor George “Mr. Sulu” Takei? I don’t know. Maybe a faint resemblance. The 2007 Sports Einstein of the year. Earlier this year, I came up with an idea to point out the absurdities of those associated with sports. More specifically, any actions/commentaries/quotes attributed to sports figures that appeared absurd (maybe even downright stupid or factually wrong) earned that person the title of Sports Einstein of the Week. Now I have to qualify that I have been too lazy to research for this bit on a weekly basis. That in itself seems odd since finding such sports inanities would seem to be the proverbial shooting fish in a barrel. So for 2008 I am taking submissions from you the readers. If I post them for a given week you will receive the proper credit, even a link to your blog if you have one. However, I have maybe about 3 hits per day on this site (Hi Mom!!). So I guess that a link to your site is not exactly a huge incentive. But it’s the best I can do. That said it’s time to bring you the Sports Einstein of the Year. In anticipation of the 2007 NFL draft, many pundits surmised that University of Oklahoma running back Adrian Peterson would easily be a Top 10 pick. And were it not for a collar bone injury in his senior season, Peterson, selected 7th overall by the Vikings, likely would have been Top 5 choice. He was seen by almost all NFL scouts as a guy who would make an immediate impact. But according to a guy named Warren, the scouts are idiots. Yes, a few days after the NFL draft Warren called in to "The Sludge & Lake Show” on Twin Cities sports station AM 1130 KFAN. Warren seems to put a lot of stock in later round picks, even to the point of lauding the Chicago Bears third selection Garrett Wolfe. So it was the following quote that earned “Warren” the 2007 Sports Einstein of the Year. You can listen to the audio from that call here. And the outrage expressed by show hosts Cory Cove and Henry Lake was classic!! History will go on without me. After the New England Patriots moved to 15-0 on Sunday with a 28-7 win over the Miami Dolphins, I was sitting in my living room all smug. Not because I’m a Patriots fan, mind you. You see, I’m among a minority of NFL fans who has the NFL Network. That is the channel where this Saturdays’ Patriots-Giants contest will be broadcast exclusively. The Pats will, in all likelihood, become the first team to go 16-0 since the regular season expanded to 16 games in 1978. As I started to call some friends and relatives to taunt them with the fact that I will have a chance to witness NFL history live, I suddenly recalled what I have planned on the 29th. I got tickets to see comedian (and Twin Cities native) Louie Anderson at Northrop Auditorium. This was a Christmas gift I purchased for my brother over a month ago so it wasn’t in the forefront of my mind. Oh well. I guess the Pats will have to go 16-0 without me. UPDATE: Well, so much for the exclusivity. The NFL caves in and will broadcast on CBS and NBC. Country star Vince Gill sings one of the best versions of Have Yourself a Merry Little Christmas I've ever heard. To you and yours, Merry Christmas!!! Vikings need help in more ways than one. During Sunday evening’s pitiful performance by the Vikings, I get a phone call from my wife’s cousin “Dutch”, who lives in the Pittsburgh area. My wife hands me the phone and I say something along the lines of “Dutch, what’s going on?” Literally for the next five minutes that would be the longest sentence I would utter. Dutch, who is a sports radio talk show host for a Uniontown, PA station, grilled me on the state of the Vikings and how a solid team like that could go with Tarvaris Jackson at QB. He then really hit below the belt and said T-Jack reminded him of Kordell Stewart. OUCH!!! Even those NFL fans outside of Minnesota are starting to pile on T-Jack. The 32-21 loss to the Washington Redskins means the Vikings need to win in Denver next week and have the Skins lose at home to Dallas just to get in the playoffs. Since Dallas has already wrapped up home field throughout the NFC playoffs (HA HA Packers!! ), it’s quite possible they’ll rest some key guys in next week’s game. Part of me hopes the Vikings don’t make the postseason. That way they might actually make an honest assessment of the QB position and realize that Jackson (5 INTs in the past two games) isn’t quite ready for prime time. Hey Donny!!! Any chance you’d like to be reunited with your old offensive coordinator? 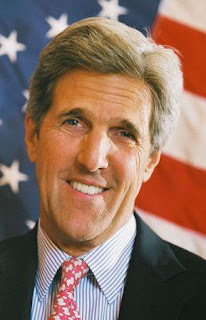 Separated at birth: John Kerry and Treebeard. Senator John F. Kerry (D-MA). 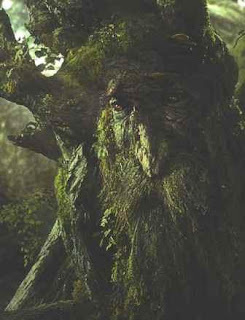 Treebeard, from the Lord of the Rings trilogy. UPDATE: DOH!! The guys at Fraters Libertas covered this one. Still a little sore and stiff from a minor car wreck Thursday (went to the Doc; all is OK), I decided to relax and do the rare channel surfing that evening. In doing so, I came across a VH1 special entitled 100 Greatest Songs of the 90s. While I prefer 80s tunes myself, I admit I found myself reminiscing fondly over some of the ditties from the 1990s. Case in point, the #84 greatest song. A guy from Canada who looks like Vanilla Ice, sounds like Bob Marley and is a rapper. On this date, fifteen years ago. It was a cool, crisp and sunny Sunday morning in Indianapolis, IN. I had been living there for all of three months when I decided to move back to Minnesota. A year earlier (in November 1991 to be exact) I had met a young lady from Indy while she was in Minnesota for a mutual friend’s wedding. We were both standing up in the ceremony and even walked down the aisle together. Long story short, we became close, had a long-distance relationship and got engaged in June of ’92, just seven months after we met. Two months after that I moved to the Hoosier state to begin planning our April 24th wedding. But almost a year to the date of our first meeting, we came full circle. She decided she didn’t want to marry me. I know that’s sounds cold, but I must confess that I had it coming. Despite the fact she was a hypersensitive control freak, I was in the midst of my most Neanderthal stage. Let’s just say I lacked a significant amount of interpersonal skills. My fiancée and I got along great when we were only talking over the phone 2-3 times per week. But when it came to having a dignified relationship on a daily basis, we just weren’t clicking. After the break-up, my ex-fiancée convinced me to stay in Indianapolis in hopes we could work something out, maybe even reconcile. Within about four weeks, I grew tired. Tired of working 50-60 hours per week at a crap job making crap money. Tired of the constant rejections when attempting to find employment within my chosen field of study. Tired of living in a dreary apartment in a neighborhood where drive-by shootings were not all that uncommon. And tired of my ex and her constant criticism of my character. I mean, I realize I was about as pleasant as a grizzly bear with a sore derrière. However, I resented the fact that I was told that on a regular basis. With that in mind, I called my buddy Rolf and asked if he would come to Indy and drive back with me to Minnesota. A few days before I was to leave I packed up many of my belongings and shipped them to my Mom’s house, where I would soon be living again. The only other items I brought home was whatever I could fit in my ’88 Chevy Nova and what Rolf could stuff in his Grand Prix. Everything else I left behind and told my ex’s family to donate the items to charity. After a long, ten-hour drive I was back home. My mother was shocked to see I had wasted away to about 155 lbs. I didn’t realize until I was home how overwhelmed and stressed out I was by my situation. But fifteen years (and sixty pounds) later, I stand amazed at the bountiful blessings God has bestowed upon my life. And I know the best is yet to come!! Being the oldest of four kids, I can’t relate to the plight of younger siblings. I imagine that when the older brother/sister garners a lot of attention, the younger bro/sis has a tendency to act out, even if the behavior is bad. Negative attention is better than none at all, in their minds. So what on earth could the younger sister of someone like, say, Britney Spears do to possibly draw attention away from the daily shenanigans of the pop star? Britney Spears' teenage sister Jamie-Lynn Spears is pregnant with her first child. Bosses at children's TV network Nickelodeon, where the 16-year-old fronts hit show Zoey 101, have confirmed the baby news. Wouldn’t be my attention-grabber of choice but to each their own. A look back at NFL Sunday. Some random thoughts about Week 15 in the NFL. - I see singer Jessica Simpson was in attendance at the Eagles-Cowboys game to cheer on Dallas QB (and boyfriend) Tony Romo. Unfortunately, Romo stunk out the joint in a 10-6 loss to the Eagles. I’m beginning to think Jess may be some sort of curse on her boyfriends and their livelihood. Is there any truth to the rumor that singer John Mayer flubbed the words to his song Your Body is a Wonderland when Jess attended one of his concerts while they were dating? - Memo to all NFL talking heads, sports commentators, etc. The name of the team in Jacksonville is pronounced JAG-WAHRS, not “JAG-WIRES”. Got it??!! Say it with me: JAG-WAHRS; JAG-WAHRS; JAG-WAHRS. - When you see the number “1865”, what do you think? Yep, that’s the year the Civil War ended. It also happens to be the number of kickoffs the Tampa Bay Buccaneers received in their 32-year franchise history without returning one for a touchdown----until Sunday. Michael Spurlock returned a first quarter kickoff 90 yards for a TD in the Bucs 37-3 win over the Atlanta Falcons. - Speaking of the Bucs, members of 1976 winless squad were cracking open cans of Grain Belt Sunday evening. That’s because their record will remain intact at least another year thanks to the Miami Dolphins finally getting their first win of the season. They defeated the Baltimore Ravens 22-16 in overtime. - Green Bay QB Brett Favre set another passing record Sunday. Earlier this season he became the all-time leader in TD passes and victories. Now you can add passing yardage to his long list of records he’s merely keeping warm for Peyton Manning accomplishments. Favre surpassed Dan Marino for the top spot having thrown for 61,405 yards in his career, which is the equivalent of 35 miles. To put that in perspective, that’s the distance from the city of Anoka to the Mall of America. - And finally, the New England Patriots became the first team since 1972 to begin a regular season 14-0. A 20-10 win over the New York Jets in miserable weather conditions (freezing rain, strong wind gusts, etc.) clinched home field throughout the AFC playoffs for the Pats. Next up, the Pats host the 1-13 Dolphins. Assuming they win to go 15-0, New England has a chance to run the table with a victory in their regular season finale at the New York Giants. That game is scheduled for Saturday, December 30, broadcast exclusively on the NFL Network ----a channel I now have!!! And here I thought I’d never be part of a clique!! After mailing some Christmas gifts today, the gal and I decided to check out the new Applebee’s near Northtown Mall. Upon arriving at the restaurant at about 2:30 pm, we noticed a few guys started to congregate at an intersection across the way. As it turns out, they were lefty protesters. While one guy was holding an American flag, the other two were holding a flag with a peace symbol and an anti-war sign, respectively. Since we live near that area we figured we could run home quick after lunch and return with a Protest Warrior sign. You know, kind of stir things up a little bit. We finished lunch about 3:15 and drove by the aforementioned intersection on our way home when we noticed the three guys were gone. What, suddenly 20 degrees and sunny is too unbearable? SAY NO TO WAR…..unless it’s too chilly. It looks to be ugly in NFL action this Sunday. The New England Patriots will be hosting the New York Jets in their first meeting since Jets personnel outed the Pats for using video cameras on the sidelines in their Week 1 meeting. I don’t think the Pats should be too haughty, though. After all, video taping opponents’ play signals is indefensible, not to mention against NFL rules. No, the Patriots are probably more perturbed at the notion that their 3 Super Bowl victories are now somewhat tarnished in the minds of their detractors. And they want to make the Jets pay. The largest margin of victory in NFL history was a 73-0 Chicago Bears win over the Washington Redskins in the 1940 championship game. I can see the Pats maybe attempting to reach that type of winning score. With 25 seconds to go in the game, Tom Brady throws his 10th touchdown pass of the game giving the Pats a 70-0 lead. On the ensuing kickoff, kicker Stephen Gostkowski shockingly goes with the onside kick and the Pats recover. A couple of plays later, the Patriots move the ball down to the Jets’ 10-yard line with 3 seconds to play. On comes Gostkowski for a 27-yard field goal attempt to give the Pats a tie for the all-time rout. But wait!!! Holder (and backup QB) Matt Cassel catches the Jets off guard. He then tosses the ball to LB Mike Vrabel, who snuck into the end zone behind the Jets wall. Wow!!! I can’t believe it’s already Friday tomorrow!!! I mean, this work week just flew by. Uh, that’s because today was the first day you worked all week. Oh. Well, it was a quick 6 ½ hours of work today, let me tell ya!! NBA point guard Ford suffers scary injury. The following video features NBA point guard T.J. Ford, which includes footage of an injury he suffered in a game on February 24, 2004. While a member of the Milwaukee Bucks, Ford collided with the Mark Madsen of the Minnesota Timberwolves. Ford suffered a spinal injury as a result of that collision and subsequently was out of basketball for 20 months. Last evening I immediately recalled that horrific collision because Ford, now a member of the Toronto Raptors, was taken off the court on a stretcher due to what appears to be a frighteningly similar incident. Ford, who missed the 2004-05 season with Milwaukee following neck surgery, stole the ball and was headed toward a breakaway basket when Atlanta rookie Al Horford hit his face with his hand. Ford landed hard on his back, his head bouncing off the floor. Given the severity of the previous injury, I was relieved to hear Ford didn’t appear to sustain any paralysis. Raptors spokesman Jim LaBumbard confirmed Ford "had feeling in his upper and lower extremities when he was taken off the floor." Ford has a web site which I’m sure will give updates on his condition. Oprah on the campaign trail. If indeed Oprah helps Presidential hopeful Barack Obama secure the Democrat nomination, what do you suppose Obama will do to her couch? I want my MTV NFL Network. On Thursday the 6th I started a brief sabbatical, given my most recent consulting gig ended Wednesday afternoon. Since my next assignment doesn’t begin until Tuesday, I decided to take care of some logistical things around the house. Oh sure, there was laundry to be done, carpet to be vacuumed and cat boxes to be cleaned. But first things first: I had to go to our local Comcast service center to pick up a new cable box. Yes, I finally broke down and decided to pay the extra $6 per month to get the Sports Entertainment tier package. Said package includes the coveted NFL Network where NFL games are exclusively broadcast every Thursday and Saturday in December. What great timing since the Bears and Redskins were scheduled to play last Thursday evening. Anyhow, after I picked up the new box I was instructed to call Comcast customer service upon hooking up the new device. After successfully installing the box, I called Comcast to get things rolling. After several minutes of carefully following the instructions of the customer service guy, all I saw on each channel of our cable TV account was the message “ONE MOMENT PLEASE. This channel will be available shortly.” Not to worry, I was told. On the day of a football broadcast on the NFL Network, traffic is typically pretty heavy. I was advised to give it about twenty minutes and I’d have my sports package. 56 hours later, I’m still waiting. Sports Einstein of the week: Kenny Williams. The Detroit Tigers hung tough in the America League Central division race in 2007 until the Cleveland Indians broke away from the pack in September. Just fourteen months removed from a World Series appearance, the Tigers mad a big splash at this year’s winter meetings by obtaining left-handed starting pitcher Dontrelle Willis and highly coveted third baseman Miguel Cabrera. Adding a phenomenal young hitter like Cabrera to a lineup that includes Magglio Ordonez (2nd to Alex Rodriguez for 2007 AL MVP), Gary Sheffield, Edgar Renteria, Curtis Granderson and Carlos Guillen, the Tigers offensive stats may rival that of a slow-pitch softball team. Then you have the Chicago White Sox, the team that won it all in 2005 but has been .500 ever since. Fresh off a 90-loss season in ‘07, the Sox traded away pitcher Jon Garland (who averaged nearly 14 wins per season over the past six years) to the Los Angeles Angels for aging shortstop Orlando Cabrera. The only other move they’ve made is acquiring OF Carlos Quentin (who????) from the Arizona Diamondbacks. I don't think there's much more I could add. I admit I never saw this coming. After a 34-donut shellacking at the hands of the Green Bay Packers a few weeks ago, the Vikings were a pathetic 3-6. They also appeared to have lost their only viable offensive threat when rookie sensation Adrian Peterson tore the lateral collateral ligament in his right knee. Many speculated that the Vikings would be fortunate to win more than two games the rest of the season. Fast forward three weeks. The Vikes are 6-6 and they now have a healthy Peterson to go along with legitimate playoff aspirations. And the remaining four games on their schedule look very winnable, starting with this Sunday against the San Francisco 49ers. If I were coach Brad Childress and I sensed my team getting a little haughty at the prospects of facing a 3-9 team, I would merely mention the date of November 5, 2006. The Vikes went in to San Francisco to take on a pathetic Niners team that had lost the previous two weeks by a combined score of 89-29. The Vikes ended up laying a Gibraltar-sized egg in a 9-3 loss. That said, I say the Vikings cover the 8-point spread. I’ve been a sports fan for nearly thirty years now. As a result, I could probably list 100 pet peeves of mine concerning all things sports, whether it is condescension by coaches and players or stupid, idiotic clichés (“We gave 110%”; “We take it one game at a time”, etc.). But I have to say, my #1 pet peeve within the context of sports has to be incessant whining about officiating. More specifically, the tired old philosophy of letting the players on the field/court/ice decide the game. To which I say BULL PUCKY!!!!!! If a defensive players grabs the jersey of a receiver beyond five yards of the line of scrimmage, that’s a holding penalty….REGARDLESS OF WHEN OR WHERE IT TAKES PLACE!!!! No defensive player is allowed to hold or push an offensive receiver or back on a passing play past the initial five yard chuck-zone. The first five yards past the line of scrimmage, the defense may jam, hold up, the receiver to keep them from getting by, but after that a penalty is awarded to the offense. Special Notes: Automatic first down awarded to offense. Got that??!! The explanation of defensive holding does not include the phrase “….unless it’s late in the 4th quarter of an important NFL game.” At least, not in any rule book I could find. New technology makes for good laugh. To quell my wife’s anxiety about my talking on the cellular phone while driving, I finally purchased a gadget called the “Bluetooth.” Certainly you’ve seen said gadget before. It’s a wireless device which you can clip to your ear, allowing you to talk on your cell phone hands free. Yesterday while I was walking around our house with my Bluetooth attached, the wife at one point began to laugh uproariously. 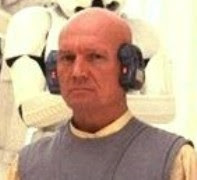 While observing me, she thought I resembled Lobot, the guy who was Lando Calrissian’s assistant in The Empire Strikes Back. I dunno. You be the judge.